So, the race I have targeted all year has been and gone. I am on a somewhat unpredictable road to recovery. It has taken a while to reflect on the race and let it all sink in. The story of 5 days / 114 hours of racing cannot be told in one report! Instead, you can look forward to reading about each day in instalments this week. The stress of getting to the start line seems so long ago now. After last minute purchases (duct tape, extra box covering, impulse need for trekking trousers etc) I was suddenly packed and ready to go. Jon picked me up on Friday morning and off we drove to Selkirk to meet up with Paul. Despite the detailed instructions we went round in circles a bit until we found his house – was this a sign? Of course, by the time we had loaded the giant pick up truck with all our stuff and squeezed ourselves in, we were later starting than planned. Cardiff is a jolly long way away, and the journey was made even longer when we hit Friday rush hour holiday traffic on the motorway. Finally we got there and met up with Sam, our fourth team member. Plenty of time for team tentel to bond over a Chinese takeaway and box waterproofing. The rest of the weekend went by in a blur, as we attended briefings, got kit ready, pored over the maps, laminated them, did the prologue and travelled up to Caernarfon. The prologue was a 10km run around Cardiff Bay, with a short white water section in the middle. In an expedition race, the usual standards of decorum (with respect to changing clothes and wee stops) are eventually thrown to the wind. I didn’t expect to do so this early in the event though. As we walked through the multi-storey car park, I realised that my shorts were on back to front. In the stairwell I hurriedly switched them over, with Sam falling about laughing and pointing at the CCTV camera. Look out for me on some candid camera show soon! We took the run at a fairly sedate pace. Paul wouldn’t have it any other way! As we got to the white water section, the leading teams were exiting and shouting a lot, which looked a bit stressful. We had to go in pairs, one after the other. Paul and I went first. The plugs came out of the bottom of our barely-inflated boat, water spurted in and we started sinking! After we took evasive action we felt lucky to get round in the boat. By the end, we seemed to be sitting below water level and steering was nigh on impossible. On the bus on the way to Caernarfon on Sunday, we watched videos of previous adventure races, which just made me stressed. Surely we’re not about to start something like that are we? They were supposed to be inspirational, but the story of two Aussie blokes who went to the South Pole and back unsupported was easier on the mind! As we tucked ourselves in overnight at the Travelodge, the wind whipped up the waves in the Menai Straits. Sam and I were sharing a room and were chatting away, whilst I’m sure Jon and Paul were sound asleep next door. Eventually I said “I think we should go to sleep now”, to which the response came back “I’m trying to!”. This was the funniest thing I had heard all weekend, as I’m sure I wasn’t the only one initiating the chat 🙂 . So I enquired what she would try next to get to sleep, since the talking wasn’t working. Perhaps a spot of dancing? The next day we had an early start. A last minute leader’s briefing brought news that because of the weather we might have a shortened paddle stage. There were a few options, but we were to get out at Bangor Pier and find out which it was to be then. We ran round the castle twice, waved to Jon’s parents (who must have had a very early start), then we were off to the beach. All we had to do was fit our new seats to sit on top kayaks (the straps go where?! ), attach our bags out of the way of our feet and launch! It was still quite choppy, but we had the tide behind us and were whizzing along. 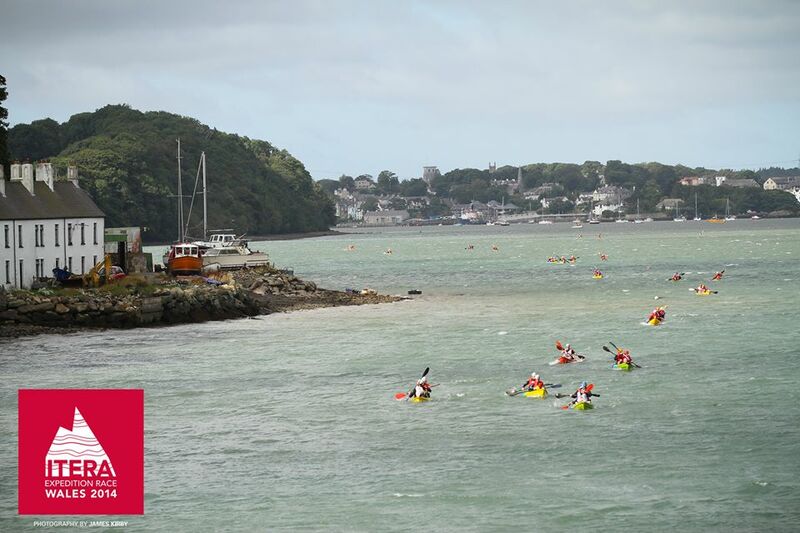 I am not normally a kayaker and throughout the race I was bemused by what was counted as a suitable ‘get out’ point. At the pier, we were directed to go past the nice sloping gangway, nose in by some steep jagged slippery rocks and try and haul the heavy kayaks up over them. I got a good dunking here as my foot slipped and I was into deep water! We rode our bikes for the rest of what would have been a paddle stage to Conwy. I wasn’t sure if I was pleased about this or not – but was probably mostly pleased! After a section on Sustrans route 8 (which I had done in the other direction with Andy last year), we dived off onto a rather pleasant off road section. At the castle, it was hot and sunny as we ran round on top of the town walls and sought out controls hidden inside the castle. 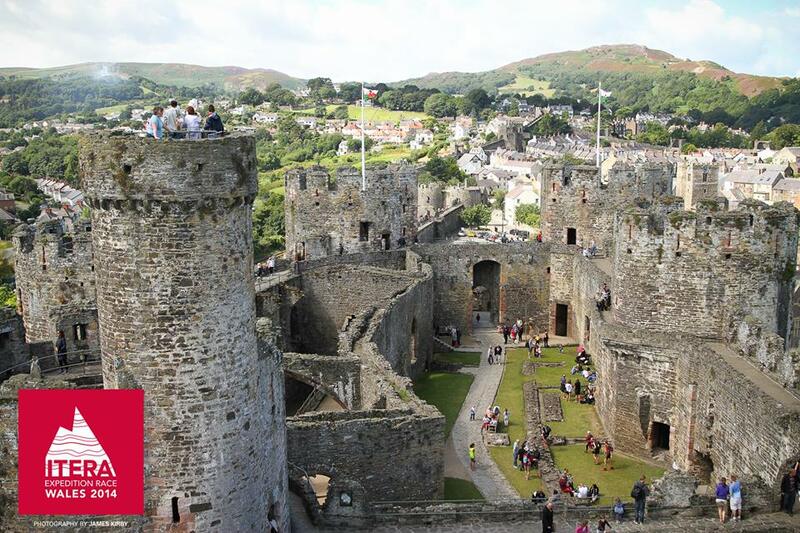 What a shame we were in a race and couldn’t stay to run up and down all the spiralling tower staircases! Our tracker wasn’t working, which was confusing people at home, so we swapped for a new one before beginning the first planned bike stage. We rode back a different way to the one we had come, passing very close but taking a hillier and more off road route. Sam admitted that our earlier pace was too much for her to maintain, so we experimented with her going on a tow behind me. I love biking and was feeling strong and perky, so actually quite enjoyed this. All the more so when she said what a difference it made to her. The wind was blowing hard into our faces so we travelled quite slowly at some points. I hoped it wouldn’t stay like this all week! The problem with travelling in lines instead of circles is that you could face a headwind all the way …. At Bethesda, Paul got a cramp (the team’s first and only all week), but it was perfectly timed just as we got to the zip wire centre. Here we had to serve a time out – the length of which was dictated by our speed in the prologue. We had 53 leisurely minutes to stock up from the fast food hatch (chips, egg roll or bacon rolls, depending on tastes). Throughout the race I think Sam and I carried far more water than the others, filling up from ‘official’ drinking water sources when we saw them. Jon and Paul went for streams and rivers, and Paul batted away my concerns that he had used taps specifically saying ‘not drinking water’. He didn’t seem to suffer any ill effects though! He must have a stomach of iron. Just before we had to go again, my dad appeared! He had been watching our tracker and only lives just over the hill from where we were. It was lovely to see him even though we couldn’t stop and chat. We had to hike up to the top of an old quarry, where there was another (timed out) wait for the zip wire. People were already sleeping in the cramped space, but I was anxious to stay alert and not miss our spot in the queue! As a Frenchman got kitted out he commented “What is this helmet for? Is it for when I smash into the brick wall at the end?”. We all found this very funny! Soon enough we were ourselves suspended face forward in a harness overlooking the quarry. It didn’t take long to get back to the bottom when we were going at 100mph, or thereabouts. What a buzz! Quick goodbyes to my dad who had patiently waited, and we pedalled up to Ogwen to say hello to Andy. Oops, no, he was marshalling and we had a job to get on with – time to pack up the bikes in their boxes and start walking! We had already made the decision on Saturday that we would miss some of the controls on this trek and immediately become a ‘short course’ team. Due to the time outs, the wait at the zip wire and our general ‘steady’ speed, it was getting dusky already. Two of the controls had also been removed due to high winds, which meant the penalties for going the shorter route were less. My map reading duties were on the bike. On the trek, Paul and Jon were in charge, so I hadn’t really appreciated what faced us. Despite going the short way, we still had a significant hill to climb! Halfway up it started raining so we donned coats and got our lights out. Paul’s didn’t work. “I tested them this morning”, he said. I asked: “And they worked then?” Duh – stupid question of the race! Luckily, spares were produced from somewhere and we continued on. The route was hard to pick out over the top, though Jon found it brilliantly. 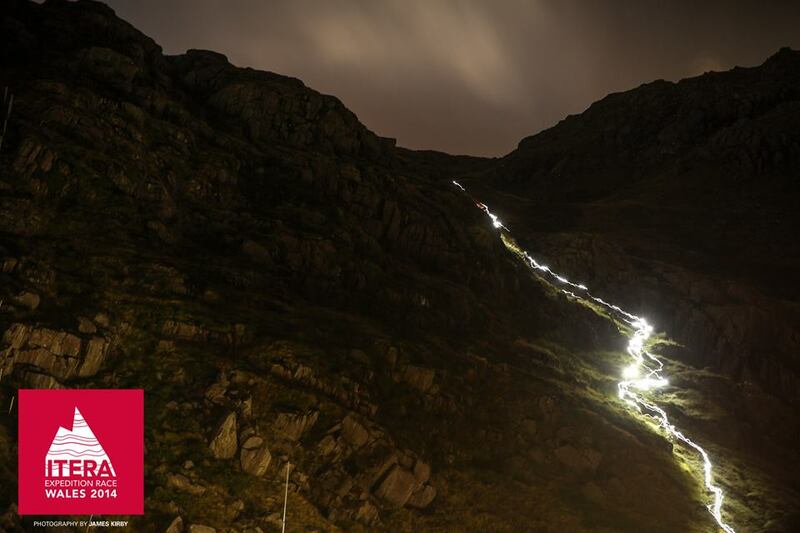 It was quite a sight to see the bright lights of other competitors dancing off Tryfan and the Glyders. At Pen-y-Gwryd whilst I munched on Babybels and oatcakes, we debated whether to head on down or go over Snowdon. We went down. In fact, we went short course for the whole of this leg. We had a plan. Despite having to switch from the long course white bib to the short course black ‘bib of shame’, we hoped that we could change the moniker to ‘bib of cunning’. We didn’t want to be chasing cut offs and knew that controls later in the race held higher time penalties than those we were missing now. If we played the long game we would have more time and energy to get these controls in the second half of the race. In retrospect, perhaps we could have been a little more ambitious on this stage, even just going for the two less committing controls with some extra climb near the end. As it was, we trotted down the road. Sam and I stared at the sky wondering if we could see dark clouds or dark sky. We were just discussing the important matter of how a certain cloud definitely looked like a poodle, when we saw the brightest of shooting stars! Amazing. The maps marked a suggested ‘short route’, but unless otherwise specified these were not mandatory. We thought we were being smart by taking a minor road (‘A’ and ‘B’ class roads were out of bounds) and linking onto a good track via a short section of footpath. The footpath turned out to be very non-existent. In fact, its route traversed The Swamp of Doom. The further we went, the soggier it got. We tested the ground with our poles before committing the next step as we fanned out a bit. I stayed near Sam for moral support and combined safe route finding, though I’m not sure who was going to rescue who. We nearly lost her in a particularly deep wet patch! Just as my patience was wearing extremely thin, we got out of there and made rapid progress into the transition. Here we had our first access to tents. It was still quite early in the race, but we knew we wouldn’t get them again until after the second big trek stage, in another 24h time. It was either sleep now, or sleep outside somewhere without a tent or warm sleeping bags. After a quick blog, we tucked ourselves up for 2h kip. Paul – ready to trek?! I have to make use of proper facilities where I find them! 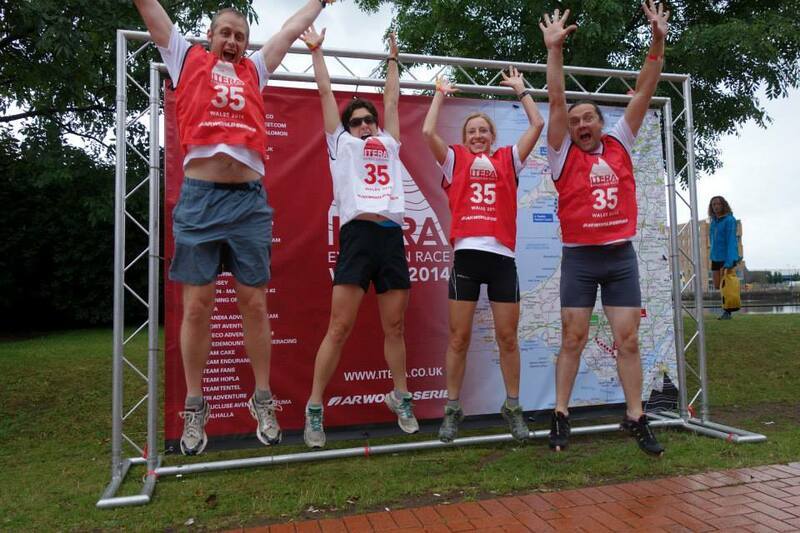 Posted on 25/08/2014, in Adventure Racing, Race Reports and tagged adventure racing, expedition, Itera14, kayaking, Mountain biking, off-road, Open Adventure, race, run, Wales. Bookmark the permalink. 9 Comments.